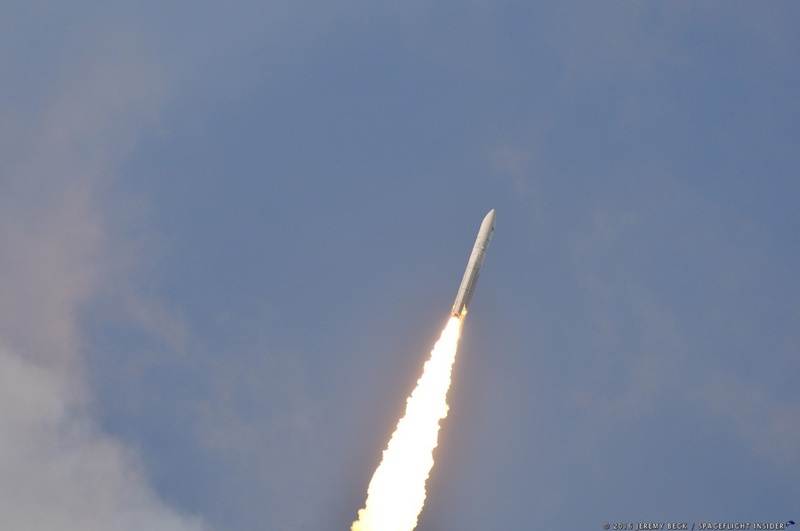 KOUROU, French Guiana — Arianespace successfully launched one of its flagship Ariane 5 heavy-lift rockets carrying a dual payload for Brazil and Japan. The launch vehicle, with the Star One D1 and JCSAT-15 communication satellites, took to the skies at 5:30 p.m. local time (20:30 GMT / 3:30 p.m. EST) from the ELA-3 launch complex at the Guiana Space Center. The launch of Wednesday’s mission, designated VA234, was conducted after a nearly 12-hour countdown, during which final checks of systems and propellant loading operations were carried out. The countdown culminated with the start of the synchronized sequence that switched the launch vehicle to onboard power mode and led to the ignition of the rocket’s cryogenic main stage (EPC) and its two solid rocket boosters (EAPs). The liftoff ended an almost two-month long launch campaign, which commenced with the arrival of the JCSAT-15 satellite in Kourou on Oct. 28, 2016. Star One D1 arrived at the Guiana Space Center two weeks later, on Nov. 14, when fit-checks and initial tests of the JCSAT-15 spacecraft were already completed. Also at that time, the launch vehicle itself was taking shape as EAPs were attached to the main stage. Next, in mid-December, the satellites were integrated, encapsulated in the payload fairing, and installed onto the launch vehicle. The launch rehearsal was completed on Dec. 17 and the rocket was rolled out to the launch pad on Dec. 20. The launch itself went as planned, starting with ignition of the EPC at T-minus zero. This was followed by ignition of the solid rocket booster duo seven seconds later. The rocket thundered off the launch pad before completing a short vertical ascent lasting about six seconds. Afterward, the launcher performed a pitch and roll maneuver and turned easterly over the Atlantic Ocean. The boosters powered the launch vehicle for the initial phase of the flight until they were jettisoned at 2 minutes, 22 seconds. The main stage continued the mission, firing its Vulcain 2 engine for approximately six-and-a-half minutes when the stage separated some nine minutes after liftoff. Meanwhile, the protective payload fairing was detached about three minutes and 15 seconds after launch, unveiling the duo of satellites. Ariane 5’s cryogenic upper stage, known as ESC-A, was ignited 9 minutes, 3 seconds after liftoff and took control over the mission for the rest of the flight. Being powered by its one HM-7B engine, the upper stage continued to accelerate the spacecraft for about 16 minutes until the sole motor burned out its propellant. ESC-A reached the desired orbit after 25 minutes, 23 seconds of flight and began its cruise to deploy the mission’s passengers. Star One D1 was released first at 29 minutes, 10 seconds into the flight. This was followed by the detachment of the SYLDA payload adapter nearly three minutes later. Finally, the JCSAT-15 satellite separated 43 minutes, 26 seconds after leaving the pad at French Guiana. However, the VA234 mission ended about 30 minutes later when the upper stage conducted a final spin-up and avoidance maneuver. The passivation of this stage was completed one hour, 15 minutes after launch, which concluded the mission. Built by Space Systems Loral (SSL), Star One D1 is a multi-mission communications satellite based on SSL’s 1300 platform. It has a mass of 6.4 metric tons and its dimensions are 16.7 feet × 7.2 feet × 7.7 feet (5.1 meters × 2.2 meters × 2.35 meters). The satellite features two deployable solar arrays generating up to 17.1 kilowatts of power. It is expected to be operational for more than 15 years. JCSAT-15 was also built by SSL and is based on the 1300 bus. It weighs about 3.4 metric tons and has dimensions of 17 feet × 10.8 feet × 9.8 feet (5.2 meters × 3.3 meters × 3 meters). The satellite is fitted with two power-generating solar panels, providing 10 kilowatts of power; its designed lifetime is more than 15 years. JCSAT-15 will be operated by SKY Perfect JSAT Corporation – a Japanese satellite communication and multi-channel pay TV company. Equipped with Ku-band transponders, the spacecraft will be used to help broadcast the multichannel pay television service in Japan. It will also provide data transfer communications, and maritime and aviation applications for the Oceania and Indian Ocean Region. While it might be thought various aerospace organizations work against, rather than with, one another, a representative with one of the satellite manufacturers stated this was not the case. Rather, spacecraft and launch vehicle manufacturers work in collaborative-competitive relationships. The new satellite will replace the company’s N-SAT-110 spacecraft, currently located at 110 degrees East longitude. The previous spacecraft in the series, JCSAT-16, was orbited in August 2016 by SpaceX’s Falcon 9 rocket lifting off out of Cape Canaveral, Florida. 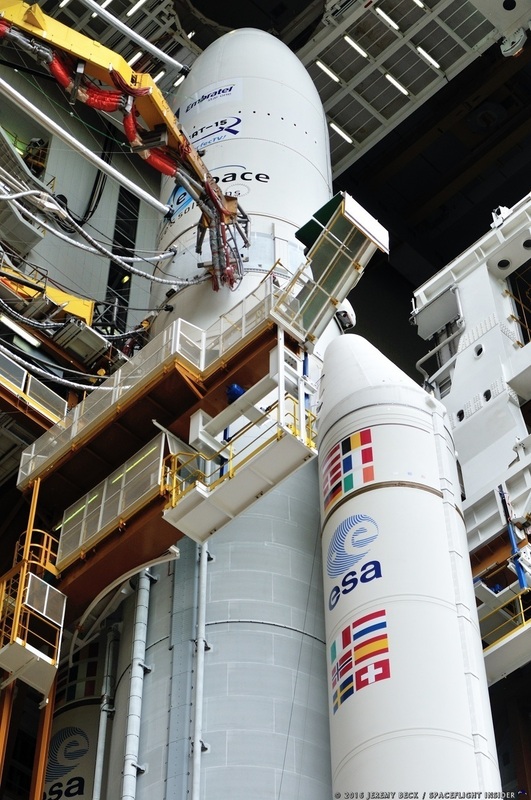 The Ariane 5 in the ECA configuration employed for Wednesday’s launch is the heavy-lift rocket Arianespace uses for missions to geostationary transfer orbit and usually carries two telecommunications satellite payloads. The flight is powered during the initial phase by a cryogenic core stage and two solid rocket boosters, followed by the use of a cryogenic upper stage for the orbital injection of the payload. Although it has the same general architecture, some significant changes were made to the basic structure of the generic version of the rocket to increase thrust and enable it to carry heavier payloads. The ECA is also used by institutional customers for non-GTO missions; for example, it was used to launch the European Space Agency’s Herschel and Planck scientific missions in 2008. 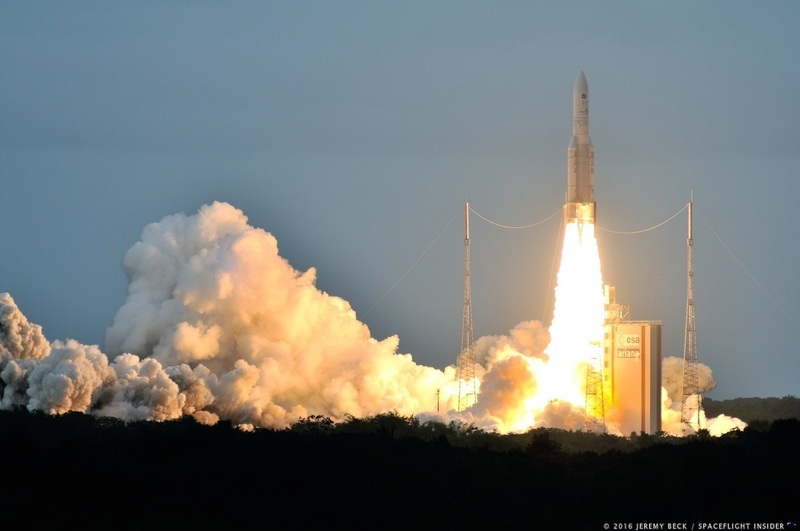 Wednesday’s mission was Arianespace’s 11th launch of this year and the seventh Ariane 5 flight from Kourou in 2016. 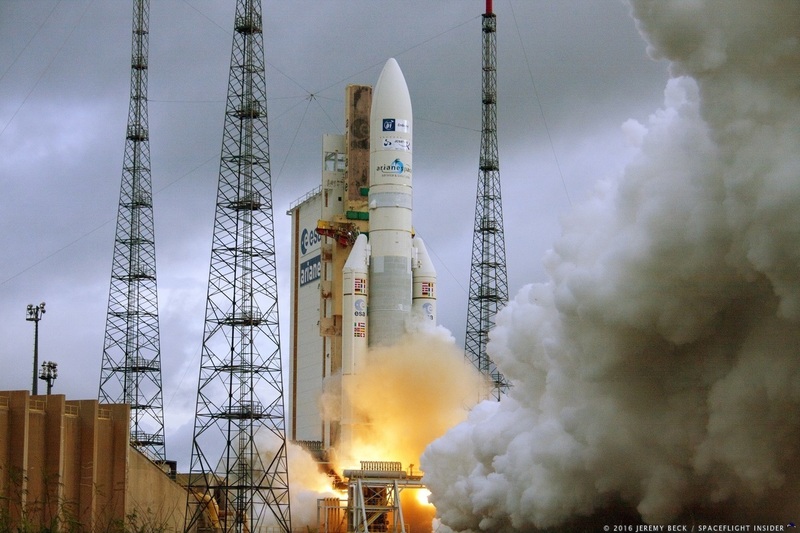 The satellites are the 60th and 61st SSL spacecraft launched by Arianespace to date. The Courcouronnes, France-based launch service provider has conducted some 283 flights since its founding in 1980 by Frédéric d’Allest. The company is notable for an array of reasons, perhaps one of the most notable being it was the first commercial launch service provider (U.S.-based SpaceX wasn’t formed until 2002 and United Launch Alliance wasn’t formed until 2006). Arianespace’s next launch is currently scheduled to take place Jan. 28, 2017, when it is planned to send to orbit the Hispasat AG1 communications satellite. The mission is currently planned to be launched via a Soyuz ST-B launcher and will also fly out of the Guiana Space Centre.